What is El Niño and what does it mean for Southern California? Read below to find out. 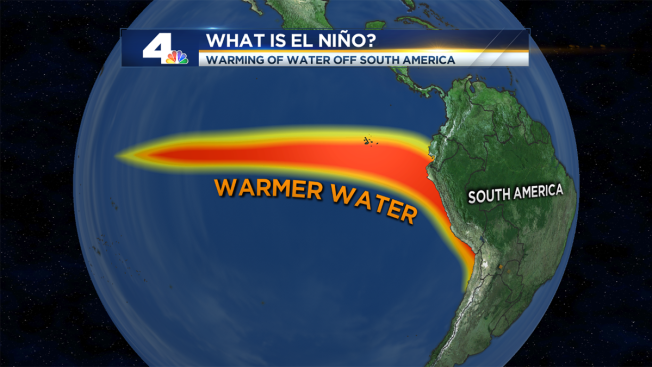 El Niño is a warming of the water off the Pacific coast of South America. El Niños are categorized by their strength, ranging from weak to very strong. El Niño is a warming of the water off the Pacific coast of South America. El Niños are categorized by their strength, ranging from weak to very strong. This past winter was a weak El Niño. No two El Niños are alike. App Users: Click here to view graphics in mobile site. El Niños are categorized by their strength, ranging from weak to very strong. This past winter was a weak El Niño. No two El Niños are alike. What does it mean for Southern California? Weather patterns around the globe are greatly influenced by interactions with sea surface temperatures and the atmosphere. There's usually an increase in Pacific hurricane activity, and a decrease in the Atlantic. Some parts of the globe will see dry weather, and sometimes North America will see wet weather. Weather patterns around the globe are greatly influenced by interactions with sea surface temperatures and the atmosphere. So it's going to be a wet winter? Maybe. This is one of the biggest misconceptions when it comes to El Niño. There is the belief that every El Niño will be like 1997-98 where Downtown LA saw 30.57" of rain over the water year. The atmosphere is not that simple. Some El Niño seasons have been dry, some wet, and others are somewhere around average. Going back through 1950, we have seen 22 seasons with an El Niño -- 12 had above-average rainfall, 10 were below-average. This data shows a slight trend towards wet winters, but you can see it is far from a guarantee. This is the part of El Niño that is impossible to predict. El Niño seasons vary -- some are dry, some wet, and others are right around average. Does El Niño mean flooding for California? El Niño does not mean flooding will occur in California. According to Jan Null with Golden Gate Weather Services, only 4 of the 10 costliest flood years in California (since 1950) happened during an El Niño season. There is a slight bias toward atmospheric rivers during El Niño years. Atmospheric river events increase the odds of flooding due to the large amount of rainfall delivered over the course of a few days. What we can expect during El Nino season. Will El Niño end the drought? The problem here is that we need not only a wet season, but a very wet season. Since we can't predict the outcome of El Niño, this is another question that we can't answer. Let's just say we have a wet season -- the next challenge will be differentiating between the meteorological and political definitions of drought. Also keep in mind that our drought is a result of several seasons of deficit. Does El Niño have anything to do with climate change? No, it is a naturally occurring phenomenon.